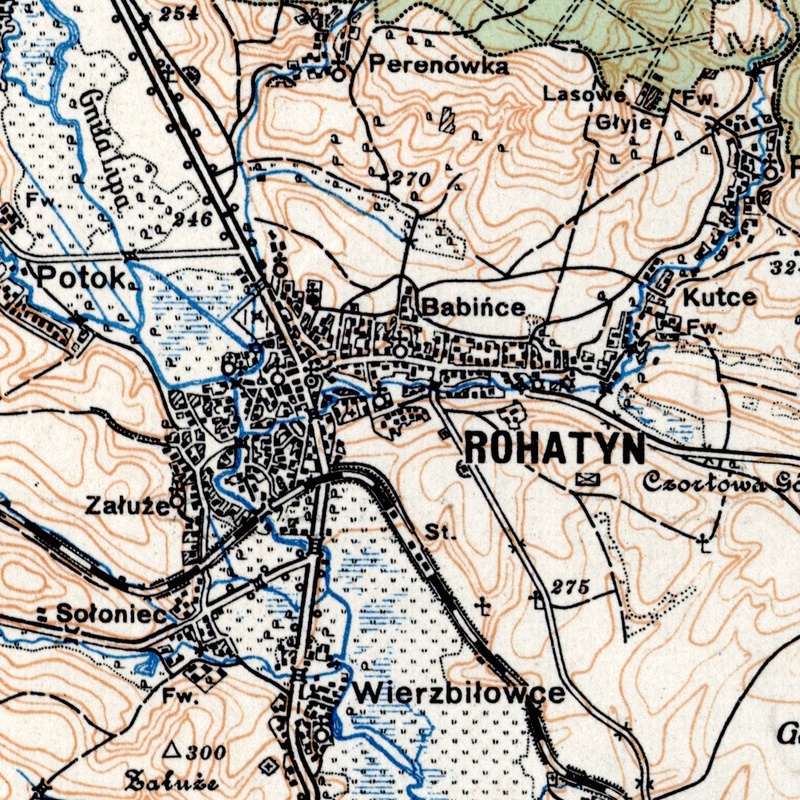 A detail of the 1926 regional map of Rohatyn. Source: WIG map archive. Following the armistice of the Great War, the newly-independent Second Republic of Poland began a comprehensive mapping effort of the country for administrative and military purposes. Initially, the maps were based on earlier Russian and Austrian maps, but the Polish authorities sent surveyors into the field to update and correct the maps of their predecessor governments. The tactical and early topographic map covering Rohatyn and the surrounding region was revised several times between 1924 and 1939; the map we present here is from 1926, from the map archive of the Wojskowy Instytut Geograficzny (WIG, the Military Geographical Institute). Originally drawn at 1:100,000, this is one of almost 500 maps published to cover all of interwar Poland and its borders, plus more than 250 covering land in adjacent countries. Not all of the published maps survive today, and some of the surviving copies are held in foreign archives; this map of Rohatyn from 1926 is from a Czech source. Another edition is available, from a print run in 1931 and without added color, but the 1931 map is based on the same 1926 survey as the map presented here. The 1926 original is the image presented here in an overlay on Bing Maps satellite data from the contemporary town. The image is interactive: pan and zoom are available with ordinary mouse controls or gestures, depending on the device, and zoom is also available by the +/- buttons in the upper left of the display. The map can be made transparent in 10 steps by sliding the control in the upper right of the image. This 1926 regional map is one of a series of historical map overlays included in the project Mapping Rohatyn: Geography as an Education Resource.